What changes will make 2019 Audi Q5 different? We’ll hope for expanded availability of safety-related driver-assistance features. Barring that, expect little of consequence for the 2019 edition of Audi’s popular premium-compact crossover SUV. The Q5 is coming off a model-year-2018 redesign that brought an all-new substructure, fresh styling, and updated technology. Call introduction of this second-generation Q5 a success; sales are up 25 percent in the first quarter of 2018, strengthening its standing as Audi’s top-selling vehicle. In the hard-fought premium-compact-crossover segment sales derby, the Q5 trails only the Mercedes-Benz GLC and Cadillac XT5. It’s outpacing such rivals as the Acura RDX, BMX X3, Porsche Macan, and Volvo XC60. 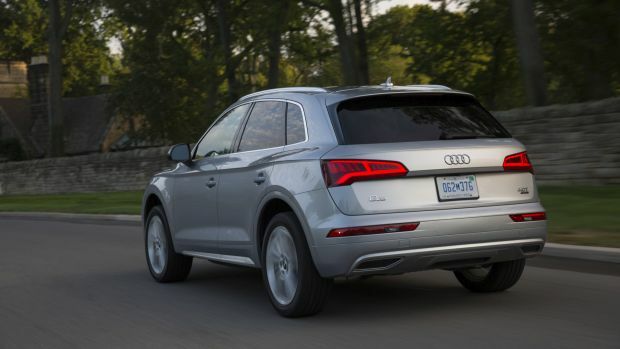 Like the 2009-2017 first-generation, today’s Q5 boasts elegant but restrained exterior styling, a well-crafted interior, and excellent road manners. Why should I wait for the 2019? To see if Audi chooses to make every Q5 available with adaptive cruise control and lane-maintaining automatic steering. For ’18 these driver assists were offered only within an option package exclusive to the most expensive trim levels. Aside from that, expect little of consequence worth waiting for – maybe a new paint color or two. The higher prices almost certain to be part of the model-year changeover certainly won’t be worth waiting for. The 2019 Q5 lineup will repeat the 2018’s. Returning will be the base Q5 powered by a turbocharged four-cylinder engine and the high-performance SQ5 with a turbo V-6. Count on both versions again offering Premium Plus and top-shelf Prestige trim levels, with the base Q5 returning an entry-level Premium grade. With mainstream automakers such as Toyota and Nissan including driver assists as standard equipment on cars that can cost less than $20,000, there’s little excuse for a premium brand not to do the same. At the very least, Audi should make these features optional on every model and price them more accessibly. It does include as standard autonomous emergency braking. But to get adaptive cruise control or lane-departure warning on a 2018 Q5 or SQ5, you had to get a Prestige model, and then spend another $1,800 on the Driver Assistance Package. Including Audi’s $975 destination fee, that pushed sticker prices to some $53,500 on the Q5 and $60,000 on the SQ5 — and that was before adding other extra-cost performance and/or convenience items. Should I buy a 2018 model instead? If this German automaker’s approach to pricing and marketing the Q5’s driver assists doesn’t faze you, don’t hesitate to shop an ’18 version of this impressive five-seater. Slotting into Audi’s crossover lineup between the subcompact Q3 and the midsize, seven-seat Q7, the Q5 is a standout for design, performance, and interior ambience. Every version comes with Audi’s estimable quattro all-wheel drive (AWD) and each exhibits athletic handling, especially the hot-rod SQ5. If, however, you like the cut of the Q5’s jib but desire something a bit more flamboyant, you might want to wait to see if Audi commits to building a crossover tentatively tagged the Q4. It likely would launch during calendar 2019 and mimic the four-door-fastback Audi TT Offroad concept. Aimed at fashion-conscious urbanites, it would probably be slightly smaller than the boxier Q5, though not necessarily less expensive. Its trendy coupe-like styling would give Audi its first answer to fastback-crossover rivals such as the BMW X2 and X4 and the Mercedes-Benz GLC300 4Matic Coupe. Will the styling be different? No, the ’19 Q5 will carry over the styling introduced with the model-year ’18 redesign. From the outside, today’s Q5 doesn’t look radically different than its predecessor, even though its body structure is completely new. Designers squared up many of the previous generation’s contours. They installed a leaner grille and headlights, making the front end look sterner but still sophisticated. More prominent cut lines give the body sides greater definition and flow into larger taillamps that are easier for following drivers to see. Despite its performance focus, the SQ5’s styling shows admirable restraint. Compared with the base Q5, it’s only visual differences are more defined grille, visible quad exhaust outlets, and specific badging and wheels. A Q5 in any guise excels for cabin functionality and materials quality. Both the Q5 and SQ5 are available with aluminum inlays for dashboard and door panels. Optional on the Q5 are several genuine woodgrain finishes, including classy “Fine Grain Ash Gray Brown” for $850.The SQ5 can be outfitted with racy carbon fiber for $500. Leather upholstery should return as standard on the Q5, while the SQ5 would get front sport seats in a blend of leather and Alcantara faux suede. Full leather and upgraded Nappa-brand hides with diamond-quilted stitching would remain optional on the SQ5. The Nappa upholstery looks like something out of a Bentley (the British ultra-luxury brand that is part of the same group that owns Volkswagen and Audi), but ordering them precludes ventilated front seats. Maybe Audi will address this for ’19, but in the meantime, those seats look and feel so high class we think the tradeoff is worth it. Passenger comfort and cargo room are excellent all around for a vehicle with such modest exterior dimensions. The rear bench seat slides fore and aft to improve legroom, and headroom is very good all around, even beneath the housing of the standard panoramic sunroof. Cargo space is fine for a small crossover, at 26.8 cubic feet behind the rear seatbacks and 60.4 with them folded. None expected. Audi is planning to add battery-electric propulsion to many of its vehicles over the next few years, but any gas/electric or plug-in hybrid Q5 likely won’t come before model-year 2021. 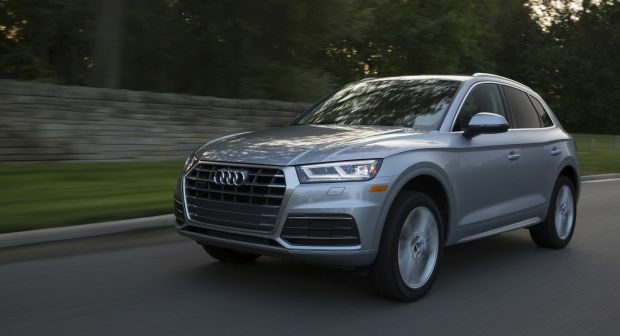 For 2019, count on the Q5 returning with a 2.0-liter turbocharged four-cylinder engine producing 252 horsepower and 273 pound-feet of torque. It would link with a 7-speed dual-clutch automatic transmission. The ’19 SQ5 would reprise a 3.0-liter turbocharged V-6 with 354 horsepower and 369 pound-feet of torque mated to an 8-speed automatic transmission. Audi’s quattro AWD would return as standard across the board. Acceleration with the Q5 should again be perfectly adequate: Audi claims 0-60 mph in 5.9 seconds. It feels a tick or two slower than that, but its smooth, prompt response means you’re not left wanting for additional muscle. The 2019 SQ5 will again be notably quicker than the four-cylinder Q5 and remain a fine foil to rivals of similar power, such as the X4 M40i, F-Pace S, Range Rover Velar P380, and Mercedes-AMG GLC43. Audi says the Sq5 does 0-60 mph in 5.1 seconds, which feels right to us. All 2019 Q5 and SQ5 models will again include Audi Drive Select through which drivers can tailor throttle, steering, transmission, exhaust, and some suspension settings to suit their preferences. The performance-themed Dynamic mode allows the Q5 to feel the most dialed in to the road, and, surprisingly, it doesn’t compromise the crossover’s firm but controlled ride quality. Handling is excellent all around, with quattro delivering superb grip across a variety of road conditions. The steering is a touch numb with Drive Select in anything other Dynamic mode, where it firms up very nicely without making the feel ponderous in slow-speed situations. The turbo four-cylinder sounds raspy during acceleration, the V-6 muscular. Both settle down at cruising speeds, where other sources of noise are minimal. Not likely, in the absence of an electrified version. The 2018 Q5 and SQ5 were near the back of the pack for EPA, and we don’t expect that to change for 2019. So expect the ’19 Q5 to again rate 23/27/25 mpg city/highway/combined and the SQ5 to repeat at 19/24/21 mpg. Our most recent test SQ5 averaged 21.0 mpg in mostly moderate-speed suburban driving. All models would again require premium-grade 91-octane gas. Will it have new features? Also unlikely, although see our earlier discussion of Audi’s driver-assist-feature policy for a rundown of our hope that the automaker would make all its safety technology available, if not standard, on every 2019 Q5 and SQ5. What’s certain is that the ’19 Q5 and SQ5 will continue to mirror each other for standard and optional equipment. Their standard-features list will again be quiet good for this class. It’ll include leather upholstery, eight-way power front seats, three-zone automatic climate control, Apple CarPlay and Google Android Auto, LED daytime running lights, power rear liftgate, and rain-sensing windshield wipers. Moving from the Q5 Premium to the Premium Plus grade of both models nets a panoramic sunroof, blind-spot alert with rear cross-traffic detection, Audi connect CARE telematics, full LED headlights, keyless access, and heated front seats with two-position memory for the driver’s seat. Prestige grades add front- and rear-obstacle detection with a top-down camera, imbedded GPS navigation with Audi’s slick MMI infotainment interface, 19-speaker Bang & Olufsen audio system, a trial subscription to Audi connect PRIME and PLUS online services, and a head-up instrument display with Audi’s digital Virtual Cockpit instrument panel. How will 2019 prices be different? It’s a sure bet they’ll increase; how much likely depends in some degree on whether Audi adds driver aids as standard equipment, makes them optional on more trim levels, or leaves things unchanged. Assuming no change, expect the 2019 Q5 Premium to have a base price around $43,000. (Estimated base prices in this review include the manufacturer’s destination fee, which was $975 for 2018). Estimated base price for the ’18 Q5 Premium Plus is $47,000 and is $52,000 for the Q5 Prestige. Expect ’18 SQ5 base prices of about $56,000 for the Premium Plus and $60,000 for the Prestige. Key options would again run to various paint colors, wood or carbon fiber dashboard inlays, and larger wheels and tires, all of which would range in price from $500-$1,600. Side-impact airbags for outboard rear-seat occupants would run $350. Heated front seats for the Q5 Premium would be $500. Also available on the Premium would be the $900 Convenience Package, which includes a memory driver’s seat, keyless access, power-folding exterior mirrors, and satellite radio. Imbedded navigation with MMI and Virtual Cockpit would continue to be optional on the Premium and Premium Plus for $2,600-$3,000. Other options for the Premium Plus and Prestige should continue to include heated rear seats and steering wheel, ventilated front seats, and rear side-window sunshades. These would be available in packages for $500-$1,450. Prestige versions would be available with upgraded Nappa-brand upholstery for about $1,250. Available on the SQ5 would be the S sport Package that has red brake calipers, sport-tuned adaptive air suspension, and a performance-bias rear differential for $3,000. Ordering this package would open access to Audi Dynamic Steering for another $1,150. Look for a 2019 Audi Q5/SQ5 release date in the summer of 2018. What change would make it better?